First up: the licensing agreement I will reference is easily found on the internet, it is freely available for anyone to read and NOT a secret. It has been redacted, a few details and several pages or paragraphs are missing but the info that is available is still very interesting. In this article I will first tell you in detail how much money Hasbro has to pay for the privilege of making Star Wars toys. And then I will highlight a few key points from the agreement that will be of interest to any collector. So even while the article is long, I encourage you to read it all if you are even remotely interested in how much money Hasbro has to pay to Disney and what other things they need to do to make Disney happy. Because once you know the details it should become much clearer as to why Hasbro does things the way they are done. For the very impatient there is a brief summary at the end of this article. I will provide links to all the original documents and news articles at the end of this article for you to read for yourself. One word of warning: the licensing agreement is written in Legalese and a very dry read. So, first up, the most important question: how much money is involved? The licensing agreement in question is from October 1997. And back then it covered all of the prequel movies. This was a 10 year deal. The original draft of the agreement said that Hasbro had to pay $450 million for the three movies in advance as the minimum guarantee. The minimum guarantee is the sum a licensor has to pay no matter what. However, shortly thereafter there was a first amendment to this agreement and Lucasfilm and Hasbro agreed on a much higher minimum guarantee. Instead of $450 million Hasbro now had to pay $590 million for the three movies. More than half a billion USD. And that agreement held for a while. But then, in 2003, Hasbro and Lucasfilm extended the agreement to 2018. And in 2003 the previously agreed upon minimum guarantee was lowered from $590 million to $505 million, probably because of the lower than expected performance of Episode II at the box office. Hasbro had, up to this point, already paid $470 million to Lucasfilm, so the minimum guarantee had been almost paid off in full. But then things changed again when Lucas sold his company to Disney and Disney announced new movies. New movies that were not covered by the old agreement. And thus in 2013 the agreement was amended and extended once more, this time until 2020. And because of the newly announced movies the minimum guarantee was raised by another $225 million. So, to sum it all up, since 1997 the Star Wars license cost Hasbro a minimum guarantee of at least $730 million. It is unknown to me if Episode IX, Solo, the upcoming live action show, Resistance, and TCW are part of that deal from 2013 (only three movies were mentioned back then) or if Disney raised the minimum guarantee once more in the meantime. However, the minimum guarantee is not all there is, since it is, as the name implies, just a „minimum“ this is what Hasbro has to pay no matter what. But Hasbro also has to pay royalties. Now, the royalty fee is redacted in the document, however back in the 1990s industry experts estimated that the royalty fee that Lucasfilm will demand would be north of 15%. That’s 15% (or even more) of the wholesale price (what Hasbro sells the figures for to retailers), basically 15+% of Hasbro’s Star Wars net sales. Actually, the Star Wars episode of the show “The Toys That Made Us” gives the exact number: the royalty rate is given as 18% in the 1990s by the lawyer who negotiated with Lucasfilm (before that it was a mere 5% and George Lucas was very unhappy about that deal), and back then this was the most expensive toy licensing agreement ever. Usually, a licensee only pays royalty fees once the minimum guarantee has been paid off. So if Hasbro paid $250 million on release of Episode I they would only pay royalties once their Star Wars toys net sales exceed $250 million for that Episode. And these royalties were increased to 20% of net sales in 2015. Hasbro’s Star Wars license for the past 21 years cost them a total of at least $730 million plus at first 18% and then 20% of Star Wars toys net sales. Hasbro’s operating margin in the past years was between 11.5 – 15.5%, in 2018 it’s a little more than 12%. Which simply means one thing: first Lucasfilm and now Disney make MORE money off the Star Wars toys Hasbro makes than Hasbro themselves. Please think about this for a while. Now, a more common royalty fee in the toy industry is something like 10%. In other words: the Star Wars toy license is the most expensive toy license out there. Which is why only a big player, a global toy company such as Hasbro, is able to afford it. For reference, when the Star Wars license was extended in 2013 the Marvel license was extended too, also until 2020. And the minimum guarantee for Marvel was $80 million, roughly 1/3 of what Hasbro has to pay as minimum guarantee for Star Wars. This gives you an idea of how expensive the Star Wars toy license is. It is interesting to note that the minimum guarantee for the then announced three new Disney era movies was relatively modest, $225 million. Compare that to the $590 million (later $505 million) for the prequel movies, which probably tells us that Disney might not have been too sure about the commercial success of the new movies back in 2013. Hasbro’s advance payment for The Force Awakens was merely $75 million. For Episode I Hasbro had to pay a total of $350 million in advance. But Disney increased royalties instead in 2015, a few short weeks before The Force Awakens was released. Disney probably had box office projections by then and knew that the movie would be a huge success. Royalties were now a very hefty 20% which is about twice as much as is usually demanded for a toy license. 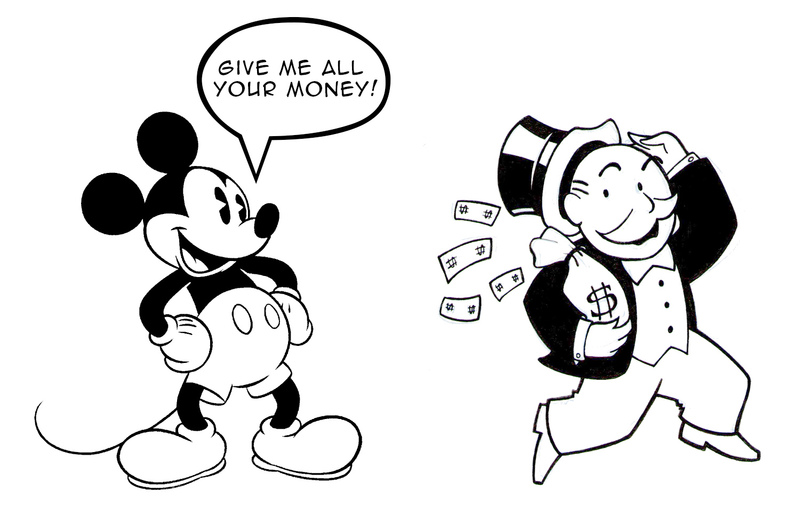 Higher royalties may earn Disney more money in the long run than asking for higher minimum guarantees. While Hasbro does not list how much was paid in royalties for Star Wars specifically, they do list how many royalties they paid overall in a year, on Hasbro’s website the records date back to 2007, so we can’t say for sure how much was paid during the prequel movie years. Remember, Hasbro doesn’t just have to pay royalties for Star Wars, they also have the Marvel license, they have the Disney Princesses and Frozen, they used to have the Jurassic Park/World license, among other things. It is known, however, how much money Hasbro made with Star Wars toys from 2010 to 2015. Given a royalty fee of 18% and then 20% (since 2015) accumulated royalty fees for the period between 2010 – 2015 may amount to about $260 million. But then there are the royalty fees for the time between 1997 and 2010, when Star Wars toys were probably a lot hotter than in the period between movies, when no new movies were on the horizon and only The Clone Wars was on TV. So my very, very rough estimate is that Hasbro may have paid about $1.5 billion in minimum guarantees and royalties to Lucasfilm in the past 21 years. These are a lot of details. All you need to remember is that the Star Wars toy license is insanely expensive and that Lucasfilm/Disney most likely make more money off the toys Hasbro makes than Hasbro, if we take the operating margin as an indicator of how much money Hasbro does keep in the end. This might explain the lack of accessories in recent years, the sometimes unpainted weapons and it might also explain why there are so many exclusives for the Black Series, since many exclusives have a higher MSRP (and wholesale price) and therefore maybe a higher profit margin. It may also explain why Hasbro loves the Black Series, since it will probably cost roughly the same to make as TVC but has a much higher MSRP and therefore wholesale price, meaning a higher profit margin. Hasbro needs to pay a lot of money to Disney and it’s quite likely that back in 2012/13 TVC was just no longer viable. It may also explain why there are so many repacks in the relaunched line to keep costs down. And it most certainly explains why Star Wars toys are so expensive. It’s not because Hasbro is too greedy, it’s because Lucasfilm/Disney demand a very high price for the privilege of making Star Wars toys. Oh, that Barge? 20% goes to Disney. That‘s $100 for each and every Barge sold. Disney will be happy. And that covers the financial aspect of the licensing agreement. But the licensing agreement has some other very interesting details, which I will touch briefly now. First of all the question of all questions: who does own all the Star Wars stuff Hasbro makes? In plain English: Lucasfilm owns everything. Hasbro owns nothing. Digital sculpts? Property of Lucasfilm/Disney. The Vintage Cards? Is a Consumer Marketing Material and/or Design and is therefore the property of… Lucasfilm/Disney. Which also means that if Hasbro ever lost the license Disney could give a new licensee everything Hasbro made, sculpts, drawings and designs, since they own it all anyway. Should Hasbro fail to meet agreed upon quality standards Lucasfilm/Disney can order Hasbro to stop production of said toy at once! One final word: the licensing agreement is from 1997. Most likely it was altered, most certainly amended and changed in the meantime, but it was never really fully renegotiated, as far as I understand it, it was merely extended several times. So while some details may and probably will be different now I believe that most of the things written in that agreement are still valid today in very similar form. Now, in light of all this… what do you think? Do you think the Star Wars license is worth it? Have you developed some more understanding as to why Hasbro does things the way they do? Remember, Disney is the one who makes most of the money here. Hasbro owns nothing when it comes to Star Wars. In light of this it makes perhaps a lot of sense not to invest too much money in all new sculpts for a relaunched TVC with uncertain performance at retail and most likely much lower margins and instead to use the sculpts they already have and put them on a Vintage Card. The Black Series has the advantage of having a higher MSRP/wholesale price and therefore, most likely, higher profit margins, provided that manufacturing costs are about the same for TVC and Black Series. And this also tells us one more thing: other than maybe Hasbro, Mattel, Lego or Bandai no niche company such as Neca, Mezco etc could ever afford the exclusive, worldwide Star Wars license, Mafex can afford it because it’s neither exclusive nor worldwide. Consider this next time you want someone else to take over the SA 3.75 inch Star Wars line. The license is more expensive than what these companies probably earn in a year. It would bankrupt them. Only if Star Wars was dead, truly dead and no longer financially successful, some small company might be able to afford the exclusive, worldwide license. But I suppose no one here wants that. We should all wish and hope that Star Wars will thrive and that Hasbro is willing and able to pay the enormous license fees and royalties in the future. Next Article: TBS6 [P3] Red Squadron Back In Stock At Amazon!